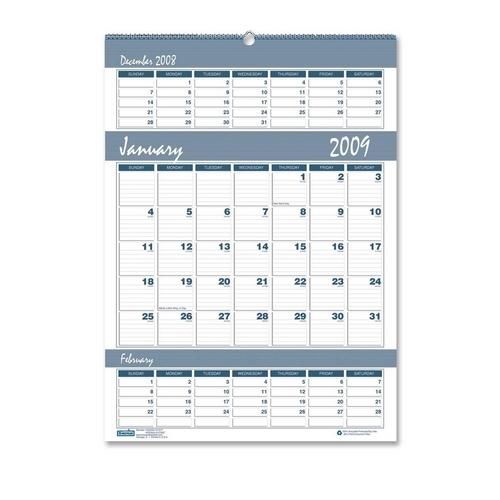 House of Doolittle Bar Harbor Triple Month Wall Calendar - 15.5" x 22"
Block Size: 2.88" x 1.75"
Media Size: 15.50" x 22"
Wall calendar offers a three-month view on a single page for easy planning. Ranges 12 months from January to December. Each page features the current month in a larger size with lined daily blocks, national and religious holidays, Julian dates and days remaining. Past and future months above and below the current month have unruled daily blocks. 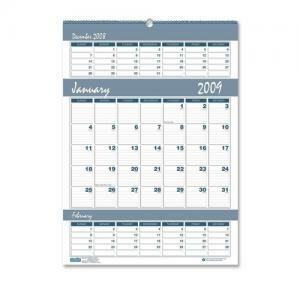 Wall calendar is wirebound with an eyelet for hanging. Printed in wedgewood blue and gray.